October is always a special month for me as there are usually a number of inspiring international events to attend. This year I was very fortunate to be able to attend the International Workshop on Software Measurement (IWSM-Mensura) in Krakow (Poland) and the IT Confidence conference together with the yearly workshop of the International Software Benchmarking Standards Group (ISBSG) in Florence (Italy). In this blog I would like to give you a little taste of the excitement that these events gave me. The IWSM Mensura conference is the result of the joining of forces of the International Workshop on Software Measurement (IWSM) and the International Conference on Software Process and Product Measurement (Mensura). Together they form the conference where new ideas from the world of academic research meet practical improvements from industry on topics of measuring software. This is especially interesting as there are many people from the industry that are struggling with similar challenges and I often get new ideas in the presentations as well as during the conversations with peers in the coffee and lunch breaks. Take for instance the ongoing struggle that many of us face when dealing with software projects that experience more (or less) than usual non-functional requirements. There is always a lot of discussion about what non-functional requirements really are. At the IWSM, a joint IFPUG/COSMIC glossary was presented that can help as a guideline in this. 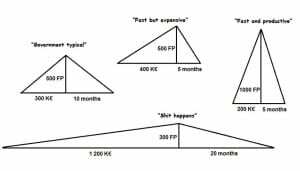 This way the triangles can be drawed and compared to for instance ‘industry typical’ triangles, like the government example above. He adds another step, to include colors to show which elements are good, normal or bad, which makes it easy for management to understand. 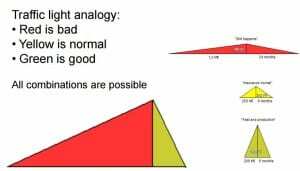 I think this concept of Triangle Benchmarking is quite interesting because the ability to see the shape of the triangle gives additional information and makes it easy to understand. Being the ISBSG president, the yearly ISBSG workshop is always an important and exciting event for me. The representatives of the ISBSG members come together to talk about and to work on topics like data collection, data validation, new website, new reports, new products, pricing and a lot of other topics. The member representatives present in Florence this year were Stavros Pechlavinidis (DASMA, Germany), Pekka Forselius (FiSMA, Finland), Ton Dekkers (Nesma), Thomas Fehlmann (Swiss-ICT), Luigi Buglione (GUFPI-ISMA and IFPUG), Arlene Minkiewicz (Price Systems, USA), Raul Fernandez (Leda-MC, Spain), Dan Galorath (Galorath, USA) and myself (Nesma and ISBSG president). This year, we welcomed a new ISBSG member at the workshop that we know very well in Nesma as well: Nesma Gold partner René Notten, founder and CEO of MetricsQuest. Also current CEO of ISBSG, John Ogilvie, was present. ISBSG needs more data, especially also for the Maintenance & Support repository. A few important decisions that were made are regarding data collection. In order to make it easier and less time consuming to submit data, 4 different types of data collection forms will be issued: very concise, concise, normal and extended. The very concise questionnaire contains only a few questions. ISBSG is going to try to embed this with the new website that is planned to go live any time soon now. In addition, ISBSG is going to become more proactive to get data. We are going to align with tool vendors to embed functionality in their tooling to submit data automatically. An automatic extraction tool for QSM SLIM Data manager is already available on request. ISBSG is going to improve the service to its corporate subscribers by issuing more releases of the repository, only to them, during the year when more data is available. Due to the fact that most users think the data portal is hard to use, ISBSG decided to discontinue this service. We are going to investigate the possibility to supply an online version of the comparative estimation tool instead. Of course I have left out many great presentations, topics, discussions et cetera from this blog, but I hope I gave you some insight in some of the things that are happening in our industry. Maybe this inspires you to attend an event in the future and/or to contribute some of your thoughts as well. Knowledge sharing remains a very important aspect, as we still need to convince the vast majority of the industry of the use of software metrics in topics like Benchmarking, Project Estimating, Outsourcing, Productivity Measurement and Project Control. Therefore, also please feel free to ask your questions and provide your ideas also on the Nesma forum .